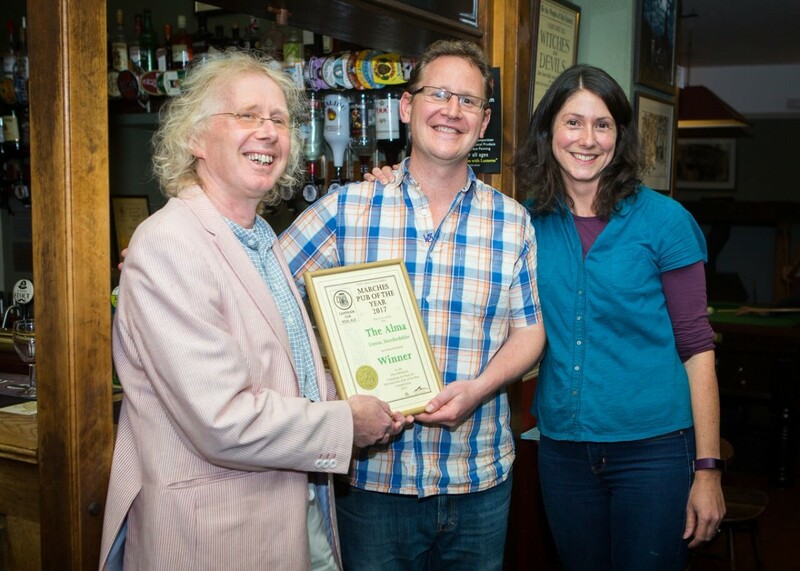 Here at The Alma we are delighted to have received another CAMRA award! We were named the Marches Pub of the Year 2017 and presented with our certificate in October. To win this award we were competing with pubs across Herefordshire, Shropshire and parts of Worcestershire. So if you are in the area, swing by for a proper good pint! We are taking a little break in September. Please make a note that the kitchen will be closed for the first two weeks in September (from Monday 4th to Sunday 17th September). The kitchen will reopen on Tuesday 19th. However, if you need to get your Alma fix, the pub will still be open in the evenings for drinks only (usual opening hours apply). Any queries, please ring the pub. Many thanks. This year’s Linton Summer Sessions is on Saturday 2nd September. The full line up of bands can be found on www.lintonsummersessions.org.uk. This one-day family friendly music event starts at 2pm (gates open at midday). We have 6 very talented local bands and artists playing on the Alma Stage, covering a broad range of music including rock, pop and soul. We also have a bouncy castle for the kids, BBQ and well stocked beer tent. It promises to be another great festival this year, to bring the summer season to a close. We have just published our first quarterly newsletter! The purpose of the newsletter is to update our friends and customers on our latest news and what events are up and coming. 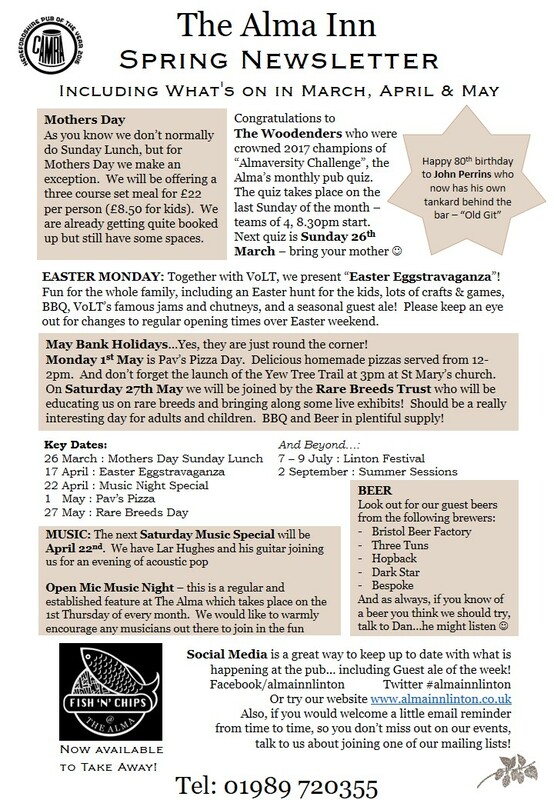 Our spring newsletter, for example, includes what we have planned for Easter and the May Bank Holidays, and what breweries Dan is talking to at the moment about guest ales! Watch this space for more newsletters, or pop into the pub and pick up a paper one! 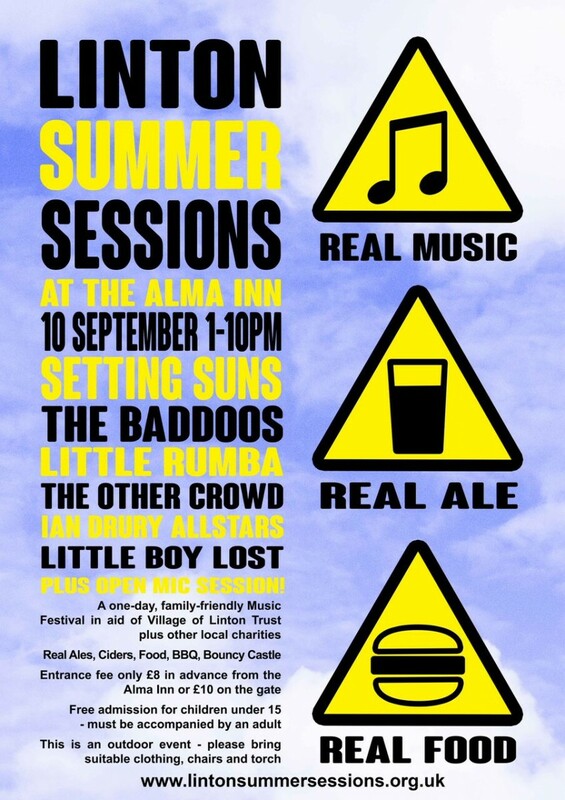 On Saturday 10th September, six brilliant bands will be taking to the Alma’s stage! Linton Summer Sessions is a small, intimate music event, where local bands play for local people to raise money for local charities. After the success of last year, this one-day, family-friendly, outdoor music festival is back by popular demand. The focus for the event will be the great music, providing the audience with an eclectic mix of rock, blues, jazz, reggae, fusion, pop, and acoustic music. This year’s Sessions present new and exciting rock/blues band, the Setting Suns, plus long-awaited return of Little Rumba offering sweet music from the Welsh Borders! Other returning bands include contemporary folk/pop trio, Little Boy Lost and legends of the local music scene: Ian Drury Allstars, The Other Crowd and The Baddoos. As well as all this there will be a great selection of real ales, ciders, soft drinks, BBQ and a bouncy castle for the little ones! To find out more about the event, including who is going to be playing, visit the website at www.lintonsummersessions.org.uk. Tickets are £10 on the gate or £8 in advance from the Alma Inn (free admission for children under 15). Any money raised will go straight to local charities, which include the Village of Linton Trust and Gorsley Goffs PTFA. We hope to see you there! The dates for the next Linton Festival are 24-25-26 JUNE 2016…. Watch this space for more details on what bands have been booked and when you can get your tickets! !